There are two lattice objects in the picture above. The two-toned material was done with ABC mode in the material lab. I used these arches originally in this image. 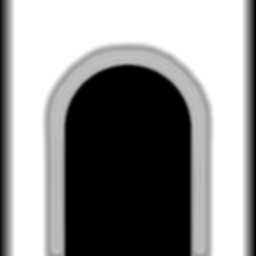 This is the greyscale-to-height map used for the arch lattice object. 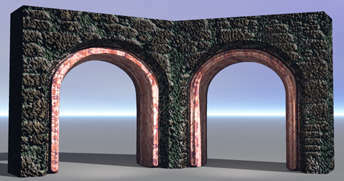 In the terrain editor, the clipping bracket determines if the archway is solid or open. This is the "alpha channel" used in the material lab in the C channel to determine which areas of the arch get the pink marble texture and which areas get the stone texture. Here's how the material lab is set up for the arch object. The first thumbnail in the C channel is not used, so any picture could go here without affecting the material. In order to make sure the C channel lines up with the lattice object, it's easiest to create it as the alpha channel in the greyscale-to-height map. 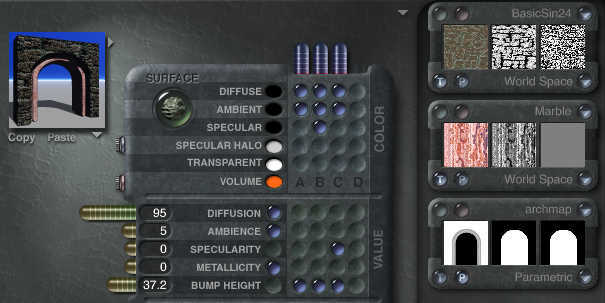 More detail on ABC mode can be found in my tutorial on the ABC's of Naturalistic Marbles.